Ranch Frostie, because the nearby businesses were called Ranch Liquor and Ranch Pharmacy. ready for another season of bringing joy and smiles to people around New Lenox, Will County’s fastest growing community with about 28,000 village residents and about 45,000 people in the region. For the time being, just like in years past, the business is closed for the winter. “The boards are coming off in mid-March,” Sestak remarked on Friday afternoon. 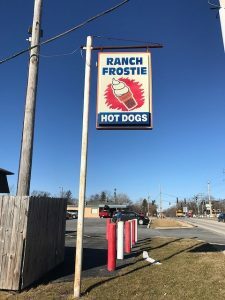 Hoyt could not be more proud to see Ranch Frostie will be opening again in 2018 and hopefully for many more years to come. “They are a great asset to the community,” she said of Sestak and Potocki. “It makes my heart proud that they’re continuing with Frostie as it is. It’s never been a chain. It’s been where you can go as a family and feel safe. It was like a meeting place, where, no matter the age, you met up with your friends. It’s just a good place to go and know that you were going to enjoy yourself whether you were at a baseball game, soccer or football.